If you love card kits, you will love the most recent one released in the Occasions Catalog from Stampin' Up! Below is a video from Stampin' Up! showcasing the kit and what you can do with it. It's so much fun to create cards when you have the inspiration and products in the palm of your hand. If you would like to order any of the products from the Occasions Catalog, you can visit my online store here. Feel free to email me if you would like me to mail you a hard copy of the catalog at any time. I'm happy to send it to you. I love the adorable little sayings how you can coordinate them for your projects. If you would like to order any of the new products from the Occasions Catalog, visit my online store here. If you would like your very own copy of the new Occasions Catalog, email me and I will get one in the mail to you. Have you seen the new Occasions Occasions Catalog? Some of the great new products are the Tag Topper Punches. These are great for creating your own tags and bookmarks and candy treats. If you would like to pick up these great new punches, simply visit my online store here today and start creating. If you would like a copy of the Occasions Catalog, email me and I will send you off a catalog. Here is an idea that I created with this new punch. You will see a slightly different version of this treat with a tutorial in my newsletter that will go out next week. After I took this picture, I added Crystal Effect to the heart. I love it! Sweet images of heart shaped hot-air balloons, fluffy clouds, and a variety of affectionate greetings and borders are just waiting to make appearances on all your Valentine’s Day deliveries. Our new Love Impressions Rub-Ons will make decorating all your love notes a snap and are so cute they’re guaranteed to win over the affection of all your favorite friends and family. They are another great product just released with the Occasions Mini Catalog. Visit my Stampin' Up! 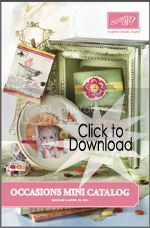 website here to view these and all the other great new products from the Occasions Mini Catalog. Tags: Love Impressions, Occasions Mini catalog, Rub Ons, Stampin' Up! Have you glanced through the new Occasions Mini yet? If you haven't, you don't know what your missing! Our Create a Cupcake stamp set and Cupcake Punch. Look below for a fun idea with the cupcake set and punch. What’s a favorite birthday treat? Cupcakes that are oh so sweet! There’s just something about cupcakes that brings joy to a person’s heart and taste buds, which is why it’s a favorite birthday theme for stamping cards and scrapbook pages. The new Create a Cupcake Set includes a variety of accessories for decorating cupcakes on your projects and cards. What could be sweeter? The Happy Birthday is from the Level 2 Hostess Set in the Occasions Mini. Card Stock: Pink Pirouette, Early Espresso, Whisper White; Glimmer Paper (the cherry) Designer Series pad of soft Subtles Papers(icing). I put dimensionals under both the Pink Pirouette and the Early Espresso Scalop Circles. It needs the lift, I think, to make it extra cute! Check out the Mini catalog or visit my Stampin' Up! website here to purchase any of the products. Tags: Build a cupcake Punch, Create a Cupcaek, Stampin' Up! By now you are probably ready to put the holidays behind you and get on with the year ahead. That year includes our new Occasions Mini Catalog. I hope you are as excited about all the wonderful new products in the catalog as I am. Do you have your wish list ready? Because you may order out of the catalog as of January 4th! The new catalog has so many great Valentines and spring products available. We have new Designer Series Paper, Glimmer Paper, Letterpress Plates, Punches and so much more. You can click on the banner to view the catalog or visit my Stampin' Up! website here to see all the new products and place your order. Please e-mail me if you still need a copy of this Mini Catalog. I will be mail it right out to you. Tags: Occasions MIni Catalog, Stampin' Up! The Occasions Mini Catalog is coming to an end on April 30th. But, the GOOD news is that the following products will continue to be available for purchase after April 30th through June 31st....how EXCITING is that!?!?! Then on July 1 we will see which of items made it into the new 2010-2011 Catalog and Idea Book!